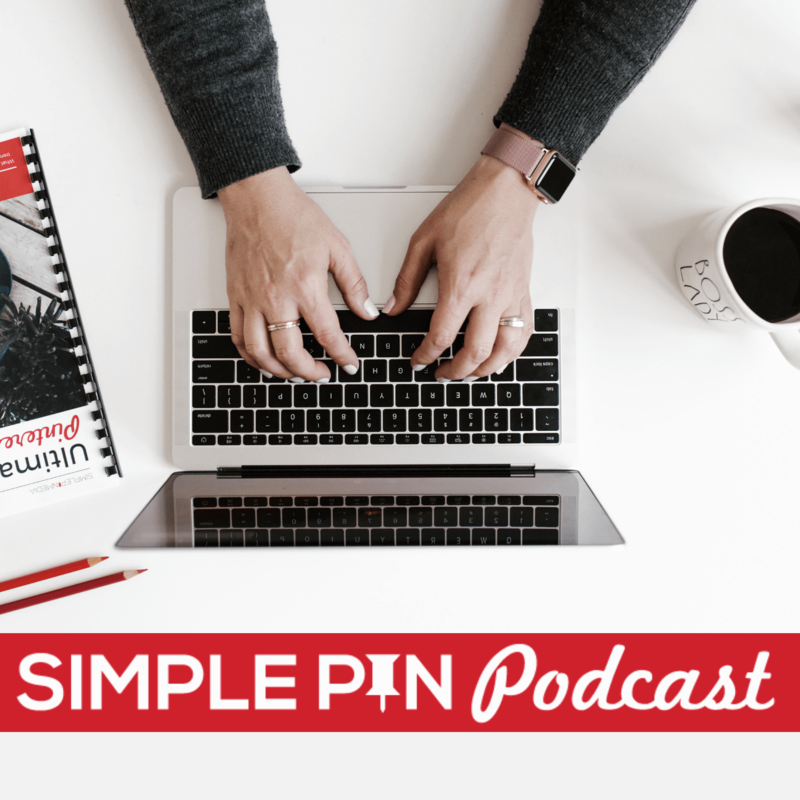 On this episode of the Simple Pin podcast I’m talking about five ways you can be successful on Pinterest. They are pretty simple tips but sometimes we need a refresher. There are a thousand different ideas as to how to pin, what to pin, when to pin, etc. you end up wasting your time Googling, following rabbit trails and wasting valuable business building time. I want to help you spend your time wisely on Pinterest and get more traffic as a result. *Note in this podcast I mention the Simple Pin Mastercourse which is no longer available for purchase. I now recommend Pinning Perfect as the best Pinterest course to take. Why is Pinterest traffic important? Pinterest is a search and discovery network. It’s where people go to curate ideas, products, dreams, plans and more. Pinterest informs their buying decisions three to six months before they purchase. YOU have amazing content that fits within someone’s content discovery, let’s help them find it. Think of it like Google. We all want our blog posts to get in front of those searching for a particular topic we’re an expert in. Apply that same logic to Pinterest. So how do you get your content in front of those searching to get in on those benefits? Many people started on Pinterest using their boards for personal use only and then merged into using it for business. What’s left is a mish-mash of boards that are scattered and unorganized. The boards don’t communicate the message you want and they aren’t set up to funnel Pinterest traffic towards your website. Many of you have heard of the Kon-Mari method of organizing. Well, now is a great time to go Kon-Mari on your Pinterest boards! Create order out of your hot mess. Here are four simple tips for cleaning up your boards. With a worksheet! Don’t delete pins while you’re cleaning up…just leave those pins alone. Who doesn’t feel like they are great at their images? I get it. You’d rather spend 3 hours cleaning up your boards before you dive into updating or upping your Pinterest image game. It seems overwhelming, frustrating and you wish you had a zillion dollar budget to pay someone. Creating images doesn’t have to be difficult. Now rinse and repeat. You’ve created the size, picked your favorite font and you can keep this same template in use on every single image to create a branded image look. Every single image. We have found that branded images, those that use the same font, look and colors have a higher rate of click thru than those that are all different. If you want more guidance on creating a branded style for your blog, website or product page, you might be interested in this great freebie from Elite Blog Academy, Branding Your Blog. So many great tips for creating a cohesive look with your images and fonts and across all platforms. If you just want someone to DO IT FOR YOU, check out our Simple Pin Images service here. There are four elements every blog post needs to be successful. Pinterest image! We just covered that. You need to have a pinnable image in the post preferably at the top or bottom. Links to related content on your site. Introduce them to more of your content they might like. For example, if you have a bread recipe that has gone viral, do you have more bread recipes on your site they might be interested in? Don’t assume they will use the search bar. Put a link in the post making it easy for them to click. Ability to share your content. Pinterest users like to share and save for later. Make it easy for them by adding a simple plug in to your site listing all the social media channels you think your readers would like to share too. Are you ignoring analytics, both Pinterest and Google, hoping/assuming everything is just swimming along wonderfully? First, it’s helpful to understand Pinterest traffic. Pinterest traffic is slow, slow, slow, slow. Seriously, it’s the slowest moving social media platform on the planet. You want to watch traffic in chunks of 1 week, 1 month and 1 quarter. Looking at them from hour-to-hour or day to day is enough to drive you to drink. You won’t see the proper trends. What took off this week, last month, last quarter and as most who already look at analytics, the last 2 years. In Pinterest analytics, you’re looking for clicks and repins. Look at them in 30-day increments. Now take that information and compare with Google Analytics. Do you see the same trends? Is the same pin in Pinterest analytics giving you the same traffic in GA? Pinterest analytics can have some glitches and I’ve seen them report that particular pin is driving a ton of clicks but when I look at GA it’s nowhere to be found. That’s why I always look at GA for my ‘real’ data. You’re looking to find the top 10 pins driving the most traffic to your site at any given block of time. Look at those top 10 and make sure the posts are optimized like we talked about in number 3. Trends also change from month to month. Knowing when something is trending up or down will help you adjust your strategy of pinning as needed. Seasonal content can drive a TON of traffic. You have to know what the best of the best is if you’re going to use your time wisely on Pinterest. Gone are the days of throwing as many Pinterest pins as you can like darts and hoping they stick. On today’s Pinterest platform you need a targeted strategy and optimized content to fit within what Pinterest calls the Smart Feed. Keyword rich pin descriptions that encourage pinners to pin. Consistent pinning to that contributes to the Pinterest community. A big question in the Pinterest community is how many times per day should you pin to get your pins seen in the Smart Feed. I’m always a fan of quality over quantity. I suggest pinning between 10-30 pins per day. If you spend time curating great content that your people interact with, Pinterest will reward you regardless of how many times per day you pin. I know that pinning more per day will result in more followers, but I want you to get traffic. Traffic brings email subscribers, monetary gain, and growing your readership. A large number of followers don’t always translate to more traffic. Pin the best of the best — both your content and other people’s content and no more than 30 pins per day using a scheduler or live. Consistency is key to the Pinterest Smart Feed! Keep your Pinterest boards clean and organized — Kon Mari those boards! Create Pinterest-friendly images that drive traffic. Four elements every blog post needs to be successful on Pinterest — The Perfect Pinnable Post! Dig into your Pinterest analytics to find what your unique audience is looking for– don’t be afraid of analytics! The ideal number of times you should be pinning every day — quality over quantity! If you are looking to stay up-to-date with changes to the Pinterest platform and get marketing tips designed just for you, make sure to sign up for the Simple Pin newsletter. It comes out every Wednesday at 5 AM EST and is chock full of tips, action items, and strategies to help you propel your Pinterest marketing to the next level. Hi Kate! I just listened to the podcast today and was so excited when in the introduction you mentioned that you were going to address how often you should be pinning your content versus other people’s content. I have been struggling to find an educated answer to this for months, but then it wasn’t covered. Help!! I’ve been told that I should be pinning 90% theirs to 10% mine, to pin equally theirs and mine, and to pin 2 of theirs for every 1 of mine. The numbers are all over the place and I’m hoping you can give me a more definitive answer. You mention a pinnable image in your content (like a blog post). However, with the recent change with most people using/reading on their mobile phones, the size image for pinterest is too big for my post. I have a responsive site, and anything larger than 600px makes the mobile responsive go wacky. What do you suggest to work around this problem? You could do 500×700 and still be good. Oh… oh my. I wish I’d known this sooner!